after me today! But, in my defense, this was square until I cut the doily! Does that work? This is for two Splitcoast challenges today – the CAS challenge and the Technique Lover’s Challenge. Both were for a quilted look, however the CAS challenge sketch clearly shows a square! Oops! Do the little squares inside my doily count??? OK, here’s how to make this. I punched 1 1/4″ squares in two types of designer papers – four of one pattern and five of the other. Next I punched the flowers and the dots. They were all layered on top of one another to make each square. Next I used my Mat Pack and piercing tool to go around each square. Next, I used my Signo gel pen to do the faux stitching around each square. Then, I glued all the squares together to make the 9 square grid. 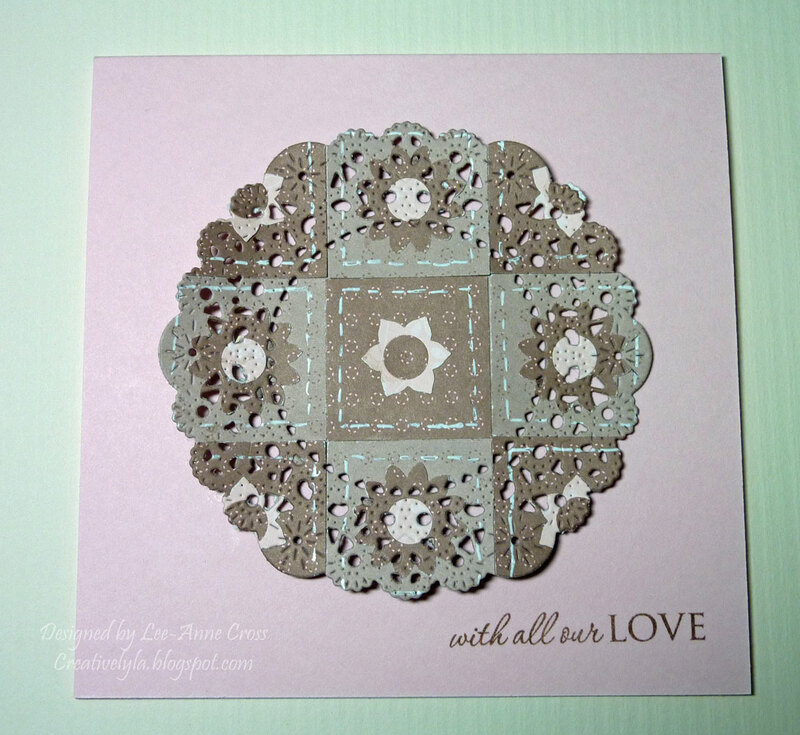 Once I was done that, I used the Cheery Lynn doily die to cut out my doily. It’s been popped up on dimensionals on a plain 5 1/2″ square card base. The sentiment has just been simply stamped in the corner in Close to Cocoa. That’s it! Hope you have a super Monday!